I’ve had several queries from my colleagues in the past couple of months about what they should do about their legacy ADX Studio Portal once official support ends. So decided to summarise all the relevant options and facts surround this in a single blog post and capture it for future reference if others want to understand this further. Most of the information you see here is presented in greater detail on Adoxio and Microsoft’s own websites (links are included below). This will be a (very) quick summary with my analysis and interpretation of the options. In September 2015 Microsoft announced the acquisition of the Adoxio Inc, the makers of ADX Studio Portals for Dynamics CRM and 365. Break fix support continued to be supported by Microsoft. However, as of August 1st 2018, Microsoft support for what is known as legacy ADX Studio Portal will be coming to an end. For Dynamics 365 versions up to 8.1.0, Adxstudio Portals version 7.0.0018 or higher will be required. For Dynamics 365 from version 8.1.1 up to and excluding 9.0.0, Adxstudio Portals version 7.0.0024 or higher will be required. For Dynamics 365 version 9.0.0 or higher, Adxstudio Portals version 7.0.0026 or higher will be required. To understand why support for legacy ADX Studio Portal has been discontinued, it is important to understand that the future of the portal platform is clearly Microsoft Portals (or Microsoft Dynamics 365 Portals). This is the Software-as-a-Service version of the portal product, and where all future investment will be. Microsoft has continued to iterate this version, extending capabilities into event management, and other workloads. So what’s the difference between ADX Studio Portal (legacy) and Microsoft Portals? Microsoft Portals being a SaaS only offering, meant that you did not have to worry about self-hosting your website. Which is great if you just need a basic website and weren’t planning to customise the solution too heavily. However, legacy portals provided access to server-side code. This allowed you to extend the solution by using the CRM SDK, .NET ASP NET code and the like, incredibly useful for UX rich websites and websites that need to perform more sophisticated workloads. 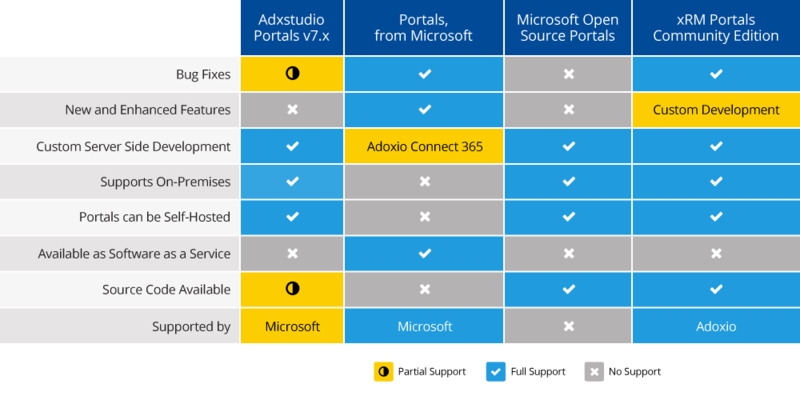 So you see we have a capability gap between ADX Studio Portal and the now Microsoft Portals solutions. How do I bridge this gap? There are a number of options on the market today. You can think about refactoring your code so that you’re on the Microsoft Portals (SaaS) platform. This should be the long term goal if you plan on sticking with the Microsoft Portals platform, as you’ll be able to take advantages of any new features that are eventually implemented in Portals. Consider using the Microsoft Portals Source version. Microsoft released the source code for the ADX Studio Portal solution under MIT Open Source licensing in August 2017. It is important that this is a one-time release and comes with no support from Microsoft, but rather the community and partners. Consider using Adoxio xRM Portal Community edition. This is known as the definitive version of ADX Studio Portal, using the Microsoft Portals Source code under MIT Licensing, this version is supported by Adoxio (the original creators of Portal) and has a paid support model in place for break-fix support. Consider using Adoxio Connect 365, which allows you to host your customisations in parallel with a Microsoft Portals instance. Essentially there is a customisation instance that allows you to load your customisations and provides you with back-end access for your code, whilst allowing a standard SaaS instance of Microsoft Portals to interact with this instance. What are key considerations when planning your next steps? Self-hosted vs SaaS – do you require the flexibility to self host your website? Do you need access to underlying source code? Do we need to make a decision to migrate right now? In my opinion, no, you could safely postpone this decision in the mid-short term while you decide where to go next. While Microsoft support has discontinued for legacy ADX Studio Portal, Adoxio now provide paid ad-hoc and support arrangements for existing ADX Studio 7 and ADX Studio Community Edition users. And whilst the MIT Open Source version of Portals does not come with vendor backed support, there are many enterprise grade applications that have been successfully supported in the past by the open source community (Apache Web Server, Spam Assassin for instance). Either way you’re not entirely without support. So how do we continue building our websites on ADX Studio Portals?